Dr. Tyler Robison is an alum of Mesa’s Mountain View High School. 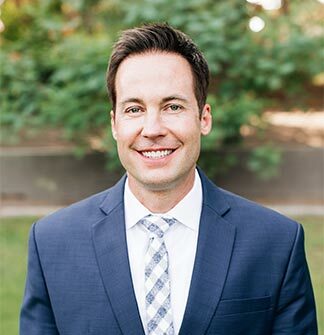 He graduted from Brigham Young University before being accepted to the “Top Ten-nationally ranked” University of Louisville in Kentucky, where he earned his Doctorate in Dental Medicine and a Master’s Degree in Oral Biology. He graduated with honors in the top ten percent of his class. Dr. Robison continued at the University of the Pacific in San Francisco, where he received a second master’s degree in dental science and his orthodontic certification. Dr. Tyler enjoys serving in his community. He is a provider for the Smile Back Foundation, which offers scholarships for free dental treatment to underprivileged East Valley students. He is also a Major in the U.S. Army Reserve and served during Operation Enduring Freedom in 2008. Dr. Tyler Robison’s favorite pastimes include spending time with his family on the lake, at the beach, or on the slopes. He is an avid and crazy snowboarder! He has three incredible sons and one sweet daughter: Caden, Jace, Crew, and Bliss. Dr. Tyler loves tacos! He is one of the owners of Backyard Taco, and can sometimes be found moonlighting there at night or on the weekends.